Prince Uche Secondus, who emerged as the new national Chairman of the opposition Peoples Democratic Party (PDP) from a now controversial convention held yesterday in Abuja, is not a newcomer to the corridors of party leadership. The businessman turned politician has spent many years playing party politics right from his days as the Youth Leader of the Rivers State chapter of the defunct National Party of Nigeria (NPN), during the Second Republic. Institute and obtained a certificate in Commerce. On his return to the country, he delved into business and soon made a name in the politics of his home state. He continued in politics even after the collapse of the Second Republic in 1983, joining several other politicians to form various political organizations while waiting for the then military government to lift the lid off politics. And when the Third Republic berthed, he promptly joined the National Republican Convention (NRC) and soon emerged as its Publicity Secretary in Rivers State. His political profile rose tremendously during the Third Republic as he was seen as one of the driving forces of the NRC in the state. As the mouthpiece of the ruling party in the state, he left no one in doubt of his ability to not only defend the NRC and the then Governor of the state, Rufus Ada-George. It was during this era that Secondus confirmed his place as an astute player of party politics. Little surprise that when democracy returned to the country in 1998, he returned with it as the Chairman of the Peoples Democratic Party (PDP) in the state. He went on to serve as a two-term chairman of the PDP before leaving the stage to move on to higher party assignments at the national level. But that was not until he earned the nickname “Total Chairman”. Explaining how Secondus came about the moniker, a chieftain of the party in Rivers recalled how the Andoni-born politician was firmly in control of the party while he held sway as the helmsman in the state. “He was totally in charge. He gave no room for dissidents to rock the boat of his leadership. He was always ahead of those who plotted to disrupt his reign. He was on ground in all the real sense of it,” our source said. On how Secondus was able to achieve the feat that made him the “Total Chairman”, our source added that as a party leader, Secondus, though he will not tolerate dissidents, was a team player. “He does not give room for dissidents to operate but if you are ready to work with him, he is a team player. With Secondus in charge, the party secretariat was always a beehive of activities. He always had something for all his team members to do. He never worked alone,” he added. 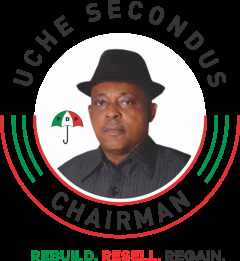 From being the “Total Chairman” of the ruling party in Rivers, Secondus, who at the time was heading a nationally renowned group within the PDP known as the G84, moved to the national stage when he emerged as the South-South Coordinator for the PDP National Campaign Council that organized the campaigns for the party during that year’s general elections in 2007.